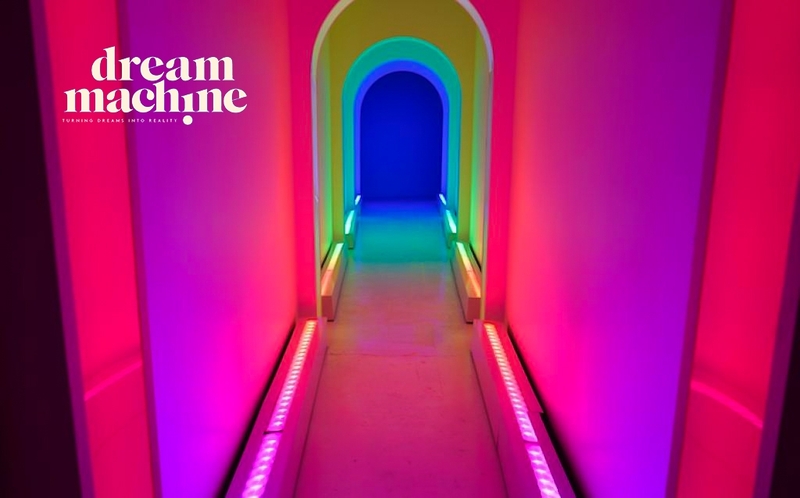 LD Devin Cameron & 4Wall Help Make Dreams a Reality at Pop-Up Museum, Dream Machine | Press Center | 4Wall Entertainment, Inc.
Brooklyn, NY- Dream Machine is an immersive, interactive art experience created by Paige Solomon located in Brooklyn, New York. The 9-room pop-up dream playground is inspired by the mysterious world of the sleeping mind. 4Wall Entertainment provided Lighting Designer Devin Cameron with lighting fixtures and projectors that were used to immerse their audience in sensational dreamscapes. The lighting design also needed to ensure every photo and video taken inside Dream Machine was beautifully lit and social media ready without the need for a flash or retouching. "I went into this design with four distinct goals for light: architectural lighting, atmospheric lighting, way-finding and flow, and face-light," explained the LD. "The architectural lighting is to create the environment and transport the audience to a location and the atmospheric lighting is to imbue the world with energy and feeling to inspire, move, and influence the audience." Cameron continued, "Way-finding and flow is used to promote a natural progression through the space to help move the audience on a journey and face-light is utilized to make the audience's photos flawless and ready for social media." 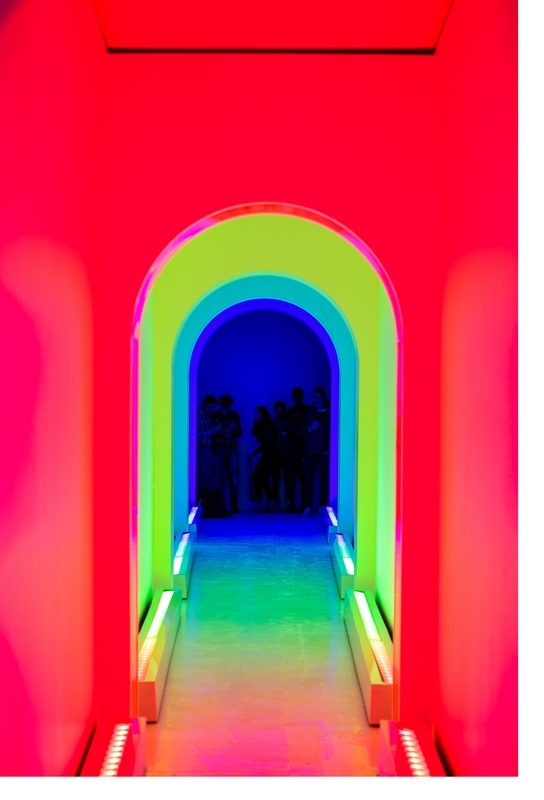 One of the rooms from Dream Machine is the Rainbow Hallway. When designing the light for this space, Cameron knew he wanted a beautiful even field of deep, saturated color from one end of the passage to the other. The challenge was how to bring light into a completely enclosed hallway - opaque walls, ceilings, and floors - without breaking up the beautifully clean and simple aesthetic of the space. "My final design incorporated 8 Color Force II 72s and 8 48s on the floor so that the beams evenly scrape up the walls for architectural interest, while also utilizing the Rose Brand Melt Out fabric ceiling overhead as an oversized bounce to illuminate portraits and the high gloss white floor," explained the LD. 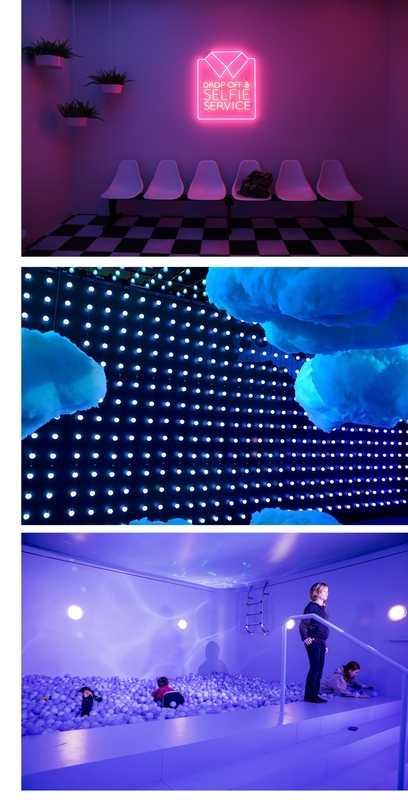 4Wall also provided 8 High End Systems SolaFrame 750 LEDs which lived in the Bubble Room. "The SolaFrame 750 is exactly what I've been waiting for in a profile LED mover," said Cameron. "The animation functions and shutters are what really set the fixture apart from others. Having both shutters and an iris was absolutely vital." For the Cloud Room and No Diving Room, Cameron utilized 4Wall's Epson Pro L1505 Laser Projectors. The 12,000-lumen output was key to bringing nature into the Dream Machine experience. "Three of the Epson projectors with .35 'snorkel lenses' were used in the Cloud Room to bring our floating clouds to life," said Cameron. "The optics and angle of these projectors are unmatched." The Dream Machine is currently being transformed into the Nightmare Machine for the month of October utilizing the same lighting and video rental package. Cameron spoke of the service he received from 4Wall. "4Wall has been a dream to work with. From the equipment quoting process to the load-in management to the overall customer service, we felt and still feel very well taken care of." (8) Chroma-Q Color Force II 48"
(14) Chroma- Q Color Force II 72"